After last week’s indulgences, I’m lightening things up a bit here today. Today is another rendition of “what we really eat day to day in real life.” It seems to surprise people when we tell them that we don’t actually eat pulled pork nachos or banana foster milkshakes regularly (I wish!). Those are once-in-awhile treats. I just so happen to share those more frequently on the blog because, well, let’s face it: people would rather read about/look at pictures of nachos than green smoothies. Fact. The numbers don’t lie. THIS “real life” dish, however, is worth sharing with you all. It is downright delicious, and it tastes far more indulgent than it really is. Which is exactly how I like my healthy stuff. I’ve ranted and raved about this in the past, and I know I sometimes sound like a broken record, but it’s because I mean it! Healthy foods can definitely taste good. Better than good. Halibut is probably my favorite fish. It’s mild and flaky and can be prepared a million ways. It’s very similar to cod. Except a smidge better. My favorite way to eat it is like this. Simply seared and basted in a little butter and herbs. It doesn’t need more than that. It’s such a clean-tasting fish, and I try to keep it that way throughout the cooking process. 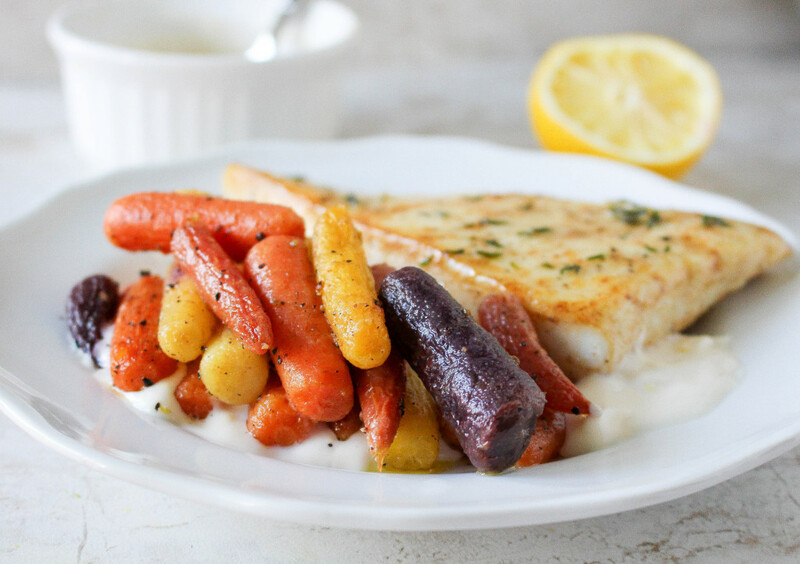 Served with a heavenly lemon aioli (which I could eat straight with a spoon) and some beautiful roasted rainbow carrots, this dish is sure to impress. The secret? It’s really easy. And quick. And all the other wonderful things I can say about a good weeknight meal. There I go again…broken record. But again, it’s because I mean it! 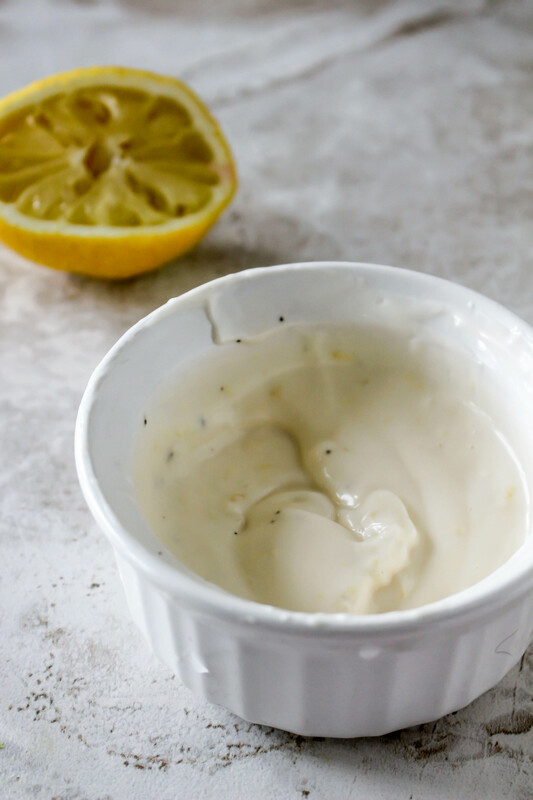 The aioli is definitely the indulgent part of this dish, but the good news is that a little goes a long way. It’s creamy, rich, and super lemony, which I ADORE. You only need a dollop. And I can justify a dollop with all that other healthful goodness going on. And then you have those carrots. Not only are they GORGEOUS, but roasting them is one of the simplest yet most delish things you can do to them. They sweeten up and get all caramely and awesome. Plus, they really are the cutest darn things I’ve seen at the market yet. The epitome of spring! Which seems to be quickly evaporating with our high-80s temperatures and muggy humidity. Blech. LOVE summer. HATE humidity. We ate this almost a month ago, and it was the PERFECT spring dish. Light, fresh, and lemony. It’s still technically spring despite the July-like weather, so I suggest you make this happen in your kitchen soon. We’re quickly entering into grilling season, and I am one to take full advantage of not having to turn on my oven or stove when it’s a bajillion degrees outside. Dishes like this are fleeting! Seize the day. Seize the halibut. That was awkward, right? Probably. Just go with it. Season the fish with salt and pepper. Heat the oil and butter in a nonstick skillet over medium-high heat. Add the fish and set the timer for 2 minutes. Add the garlic and thyme to the pan and baste the fish with the butter-oil mixture as it cooks. Flip the fish over and cook for another 2 minutes, continuing to baste it with the pan juices. Remove from heat and allow to rest slightly before serving. Whisk the egg yolk until pale yellow. Add in the garlic and then stream in the oil VERY SLOWLY. Once the mixture emulsifies, add in the lemon juice and zest and season with salt and pepper. Keep covered until ready to serve. Can be made ahead and kept in the fridge. 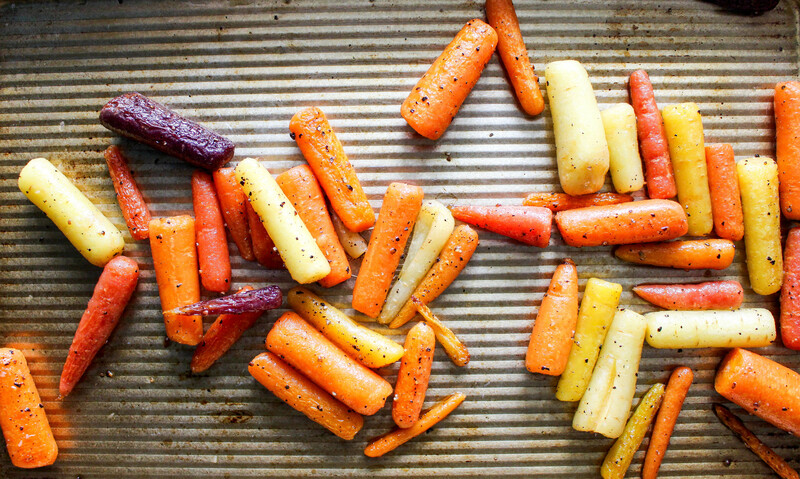 Toss the carrots with the oil, salt, and pepper and place in a preheated 450°F oven on a baking sheet. Roast until tender and caramelized, turning once or twice, about 15-20 minutes total. 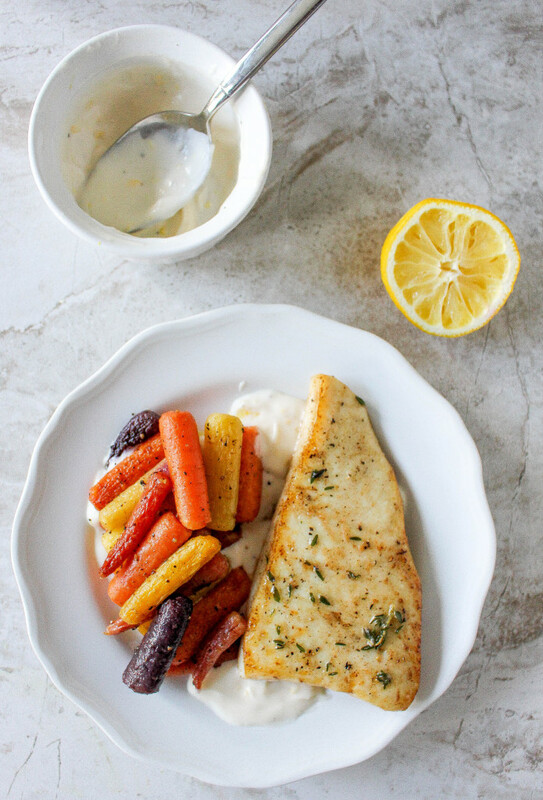 Place a dollop of the lemon aioli on each serving plate and arrange the carrots on top. 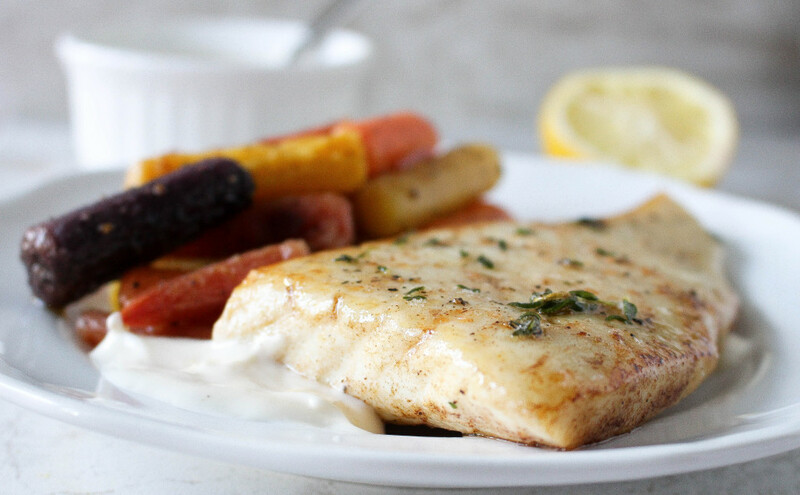 Place the fish beside the carrots and serve with additional aioli on the side.